My shocks are shot and I was torn between Falcon and Ikon and was talking to one of my pals who has raced classics for thirty plus years and he recommended the Falcons, he had no experience of the Ikons but has used Falcons on a number of bikes with good results. Anyway as I’d been trawling through the suspension threads on here it go me thinking about the forks too so I’ve ordered a pair of Falcons and a pair of Lansdowne dampers. Both the dampers and shocks are going to arrive next week but then I’m away in Spain the following week on another bike so fitting will have to wait a week or two. Both Robin at Falcon and Don at Triton Motorcycle Parts have been great to deal with and I’m now looking forward to packages arriving. I have to say I’m impressed with the delivery times. I ordered the Lansdowne kit on Tuesday of this week and they arrived today (Friday of the same week) from the Philippines where Don is based, excellent service. They look very well made and the packaging was next to bulletproof. The Falcons also arrived today and were ordered on Tuesday, bearing in mind that they were not off the shelf but built to order I was impressed with their service too, a benefit of ordering at the tail end of the racing season I suspect. The shocks as with the dampers have a quality look and feel about them. Further updates once fitted and test ridden. However the fork seals, ordered on Wednesday, won’t be here until Monday so nothing will be happening with the forks this weekend. Looking forward to report on the rear shocks. Looking forward to seeing a pic if the falcons. I'm in the process of ordering from robin. Set up similar to your but I've not fitted the landsdown kit yet. Umming and arghhing with the turcite bushes and what oil. Will upgrade springs to single racetech for the belly weight depending on how I get on with stock that Don fits. Fitted the Falcons today and the spring rate is bang on for my 15st - 110 lb/inch springs give me 4mm static sag and 19mm dynamic sag after adjustment, Robin recommends 25% dynamic sag which is 19mm of the 76mm travel. No issues with the standard chain guard they even clear with the adjusters right at the bottom of threads. p400 and Jungle_re like this. Falcons are good shocks, and incredibly light. And well priced given their quality. Good choice Dave. Thanks Eddie, I was going to go for Ikons but one of my pals recommended the Falcons and as he’s a pretty handy rider/racer his word was good enough for me. Right I’m back from Spain and have set about the forks. I’ve stripped them and found some wear in the bushes and one small pit on the right stanchion which is on a section that the seal sweeps so needs to be replaced. A full set of bushes and a pair of stanchions are now ordered and en route. Hopefully I’ll get in the workshop on Thursday evening that is if the bits arrive. Oh I’ve also upgraded the charging system to three phase to replace the tired current single phase set up. Be careful to measure each stanchion with a micrometer at several places along the tube, and 90 degrees around the tube at those locations when you receive them. I now know more than I ever cared to know about some of the foibles and recent history of Commando fork tube manufacturing. Thanks for the advice, I will check carefully. There’s no point in going to the trouble of sorting the suspension then fitting dodgy components. I went with Koni shocks for my Norton in 1979 they were a lot of money in them days $245 but they are still on my Norton after 39 years and lots of miles on them, I had to rebuild them for the first time about 4 years ago when one blew the main seal but only $40 for the rebuild kit from Ikon and only took about 3 hours to do both shocks, thats the good thing about them they are rebuildable, I also brought a new set of Ikons ($540) for my project bike and they are the same as my Koni shocks but shorter for the Slimline frame, I was given a set of Ikons for my 900 Triumph Thruxton as my mate didn't like them because they had a few chips off the spring paint, he is very fussy but they work great and are the same as my old Koni with 3 spring settings and 4 damper setting, I orginaly was con into putting a set of Gazi shocks on my Triumph and had to much troubles setteing them up right and they blew a main seal in less than 12 months, I have since put them back on as I am selling the Triumph and wanted to keep the Ikons as a spare set. 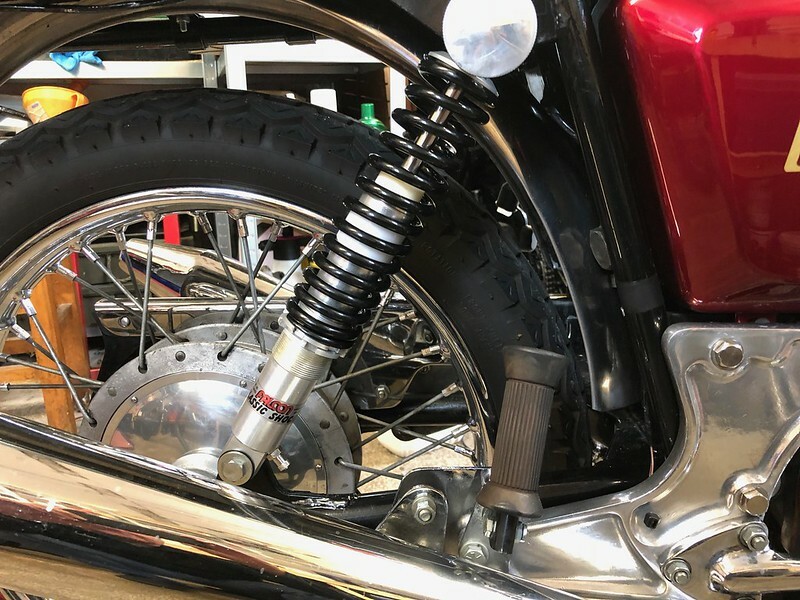 I have a set on Koni shocks on my Rickman Triumph that have been on there since 1991 and are still in good order. Stanchions have arrived they are both parallel and round measuring 1.358" at various points along their length and measuring at 90 deg. I'll be building them this evening. Dave do you think you will get the same run with the Falcon shocks, I always keep with a brand that has proved themselfs over time as you know Ikons are Koni shocks, the new Ikon are exactly the same as my old Koni's and are still steel body, when I put the Gazi shocks on my Triumph they were alloy bodies and that was where I had problems with them and the first day when adjusting the spring rate the alloy thread was stripping and after 12 months the main oil seal blew so it put me off the alloy body shocks, Gazi Australia was good to deal with but made me sent my shocks to his dealer and repair agent in Brisbane and thats where my biggest problem started, after being treated like shi. with the dealer's addtude and BS I already had the Ikons to put on, I do a lot of miles on my bikes. The Falcons were recommended to me by a good friend who has many years experience in the classic racing world and he knows his stuff. I get your point about the Ikon/Koni shocks but I do like to try different things. Falcon were great to deal with and they’re local as in they’re in the UK. Hopefully I won’t be disappointed. Having measured the Koni shocks on my Rickman yes they will however i’ve Not tried to fit them. Falcons fit with good clearance to the chain guard.